I decided that this past weekend was the time to finish off the warp on my portable “Baby Mac” loom. This was what was left from the 3-day “Warp-Faced Weaves” workshop I took in June from Kay Faulkner at the ANWG Conference in Bellingham. I had previously done a sampler and hoped I had enough warp left for 4 placemats. I had also worked out various motifs for pick-up in the sotis areas, using Excel for a charting tool. The plan was to do all the mats the same, except put a different pick-up motif in the 4 corners of each one. I also used, as a guide, Kay Faulkner’s article Sotis Cloth from West Timor in the March/April 2013 issue of Handwoven magazine. At each end, I wove 1-1/2″ with a single weft in plain weave, to reduce bulk. These were later turned under twice and sewn down for the final hems. 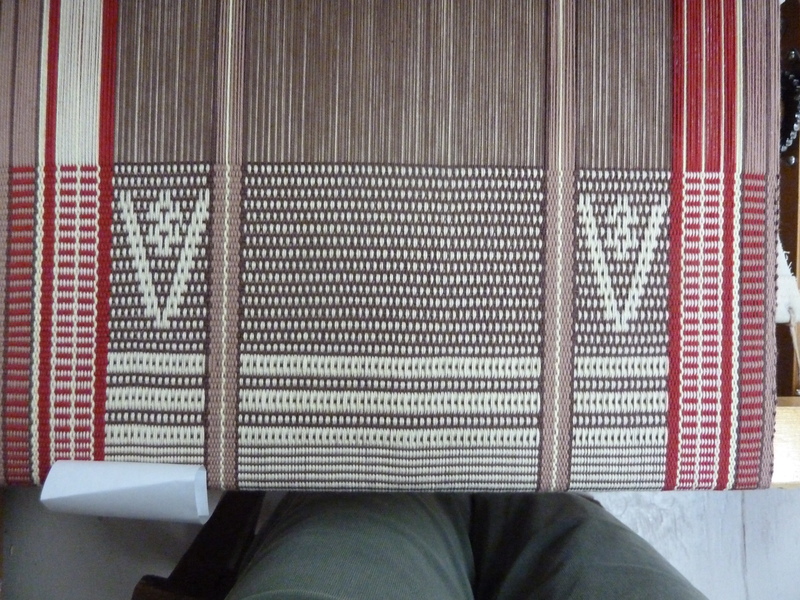 The body of the mat is woven with a doubled weft. I only had enough warp to finish 3 mats of the same size, plus another small piece about half their size. But that is OK, since these are a little wide for a typical placemat (I was stuck with the warp width I had put on, long story). Will I do this again? Actually, yes! But next time, I will use mercerized cotton (for placemats). For this workshop project, I used Valley Yarns 8/2 Cotton from WEBS, and it is lovely stuff – soft, smooth, strong, great colors. But on washing, it didn’t so much shrink as “bloom”, especially in the sotis areas where 3 ends go through one heddle (alabaster, in this case) and a single end goes through the other heddle (brown, in this case). The 3 ends that go together, kind of fluffed up and wound up obscuring the pattern in the wider stripes. 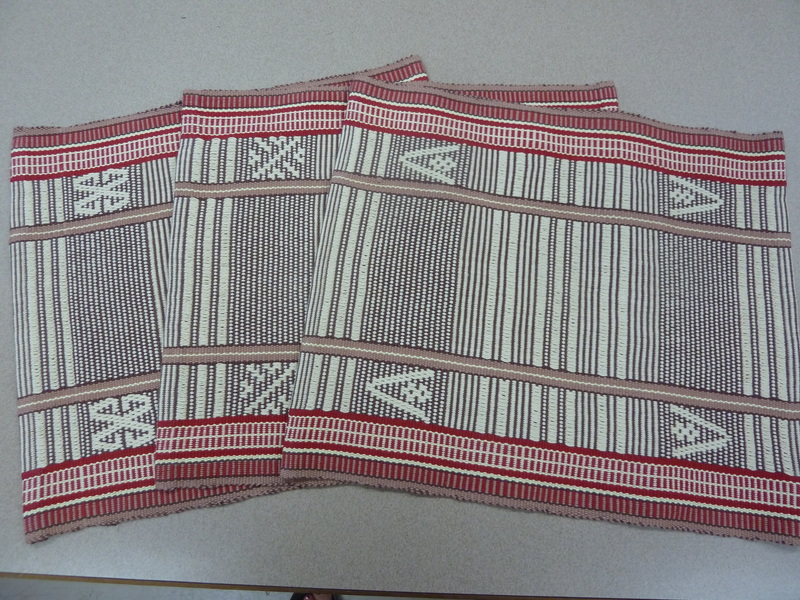 The brown “dots” in these wide stripes are much more visible in the first picture above, on the loom and before washing. These are wonderful. The motifs add to the beauty if the placemats.